Another unique Pokemon gaming adventure is waiting for you explore. Pokemon Cyan Version is a FireRed based game that revolves the story of Team Rocket and their evil doings. Team Rocket was once defeated, but they came back for an act of revenge and aimed for another destruction. You are now 12, and as you’ve always dreamed, you can now start your journey to becoming a Pokemon trainer, catch Pokemon, earn badges and defeat other trainers via Pokemon battle. Team Rocket will try to catch the legendary Pokemon Regice; you will uncover the real plans, and it’s up to you whether to join them or stop them. 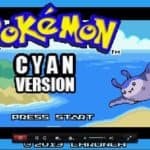 Discover the unique map, items, skills, and adventure of Pokemon Cyan, download now to get started. How many gyms are there currently available? Honestly I don’t have idea mate, I haven’t explored the whole game yet. Save error? what do you mean? I Can’t relate to your problem and I’m unable to give you the fix if you provide only a few details.